Chinese TV Rips Off Popular Japanese Anime? 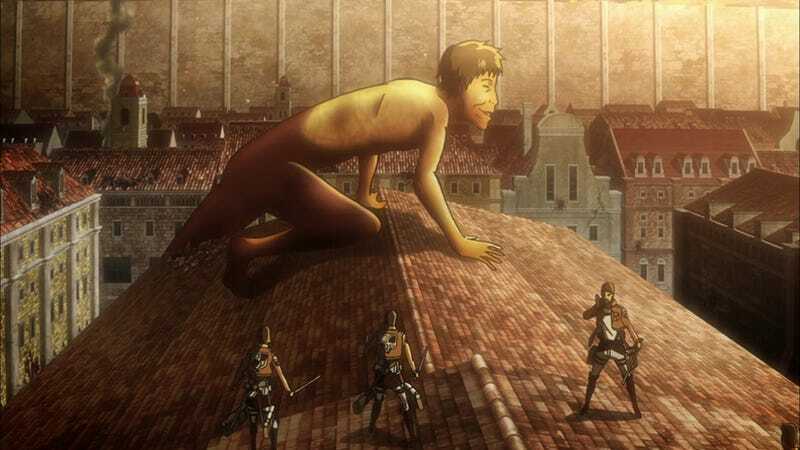 One of this year's most popular Japanese anime is Attack on Titan. The show isn't only popular at home in Japan, but also in other countries, including China. There, the anime's opening recently became a focus of internet controversy. A Hunan TV talent show called Happy Man Voice: Super Boy used featured a segment called "Attack of the Beautiful Men" that looked incredibly similar to the original Attack on Titan opening. Here is the original Attack on Titan opening. Here is the clip from Happy Man Voice: Super Boy. Comparisons between the two (Attack on Titan is on the top of each image set). Online in China and Japan, people are calling the show a shameless rip-off. Others are saying this is just a parody. Some anime fans in China seem pretty ticked off! "Hunan satellite TV is just garbage," wrote one net user on Chinese microblogging site Weibo, while another chimed in, "You call these men beautiful? Don't stain the name of my Attack on Titan." Happy Man Voice does seem to use the Attack on Titan theme song, so unless the program licensed that, it could soon be facing an attack of lawyers.